The Karell drop veil falls to the hip in a way that’s both simple and breathtaking. 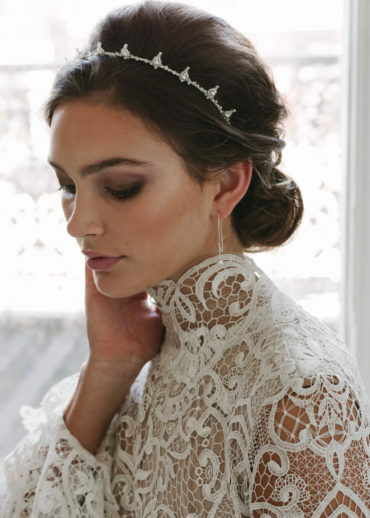 Featuring a beautiful sleek style for the bride with modern styling in mind, its drop veil style lies flat against the hair due to its fuss-free and ungathered attachment to the comb. Think mod glam rather than a big poufy veil! The Karell embraces the simplicity of a clean palette, creating a structured, graphic effect which we love to style with modern silhouettes or simpler sheath dresses. Measurements: Hip length at approximately 80-90cm. The Karell wedding veil is made to order. Please allow 2-3 weeks for production plus delivery times. Rush orders available for a fee. As this veil is made to order, please leave your height and heel height measurement at checkout so we can keep it in mind when we create your piece. Please also let us know where you intend to position the veil’s comb (at the crown, above a low set bun etc), as this will impact the length of the blusher and the veil. If you have any questions, please feel free to contact us to discuss! The Karell is designed to fall to the hip but it can be shortened to elbow/waistline length for a slightly lighter feel. Short and sweet, this flattering cut complements a wide range of dresses for an effortless look. 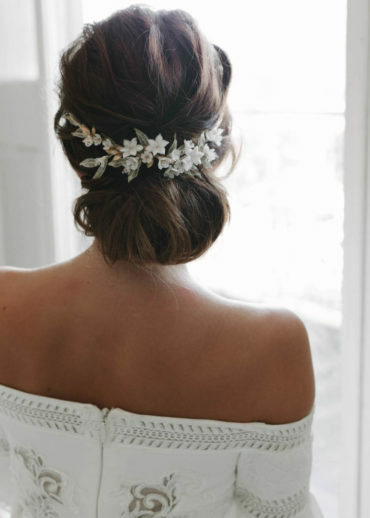 When styling with headpieces, we love to style it with organic elements for an unexpected contrast of ethereal elegance. Browse our full headpiece collection or contact us and we’d be happy to offer a recommendation based on your wedding dress and hairstyle. The Karell attaches to a metal comb which can be secured at the crown. Upon request, we can create the Karell without a comb so it can be secured to a romantic updo with hair pins by your hairstylist for a seamless finish. Karell is a hip length veil that’s designed to fall to approximately 80-90cm depending on your height. It can be customised to any length to suit you. If you are unsure which length will best suit your wedding dress, please contact us with photos of your wedding dress and height details and we can get back to you with a recommendation. Karell is handcrafted from a lightweight bridal illusion tulle. It’s available in bridal white or soft ivory tones. We like to aim for a colour match or a shade lighter than your wedding dress.